The event was held at the USC Stauffer Pharmaceutical Sciences Center. 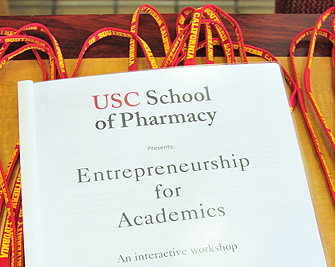 The USC School of Pharmacy welcomed more than 100 attendees on March 10 to “Entrepreneurship for Academics,” a USC Center for Excellence in Research-sponsored event designed to share ideas and inspiration with current and budding entrepreneurs. Among the attendees: graduate students, postdoctoral students and faculty from several schools, including the School of Pharmacy, the USC Davis School of Gerontology, the USC Dornsife College of Letters, Arts and Sciences, the Keck School of Medicine of USC and Children’s Hospital Los Angeles. The day featured three panel discussions, with time allotted for questions and networking. Rosemarie Christopher, founder and CEO of the MEIRxRS family of companies and a member of the Board of Councilors at the School of Pharmacy, led the first panel. Ahmed Enany, president and CEO of the Southern California Biomedical Council, led the second panel. The third panel, which consisted of USC entrepreneurial leaders, was led by assistant professor George Tolomiczenko of the Health, Technology and Engineering program at USC. The panelists represented a broad swath of entrepreneurial experience and inspiration. Former animator Robin Levine was motivated to found Eco-Me, a manufacturer of natural cleaning and pet products, out of a concern for the dangers of toxins in everyday products. Bruce Blomstrom, who has three decades of experience in health care companies, is president of the Pasadena Bioscience Collaborative, an incubator for early stage life science companies. Elizabeth Iorns co-founded Science Exchange, an online marketplace for science experiments, out of frustration while a breast cancer researcher. Panelist Nima Shiva has been in the life sciences industry for more than two decades, taking on roles as scientist, investor and entrepreneur. He currently serves as managing director of Convergent Investors, a venture capital firm specializing in early stage investments. USC panelists included Nathalie Gusset, who heads business development and marketing for the Alfred E. Mann Institute for Biomedical Engineering. Other Trojans on the panels were Karen Kerr of the USC Stevens Institute for Innovation, Kathy Allen of the USC Marshall School of Business and Stephen Mackey of the USC Clinical Research Organization. A grant from the USC Center for Excellence in Research supported the event. Llewellyn Cox, program administrator for research at the School of Pharmacy, served as director.